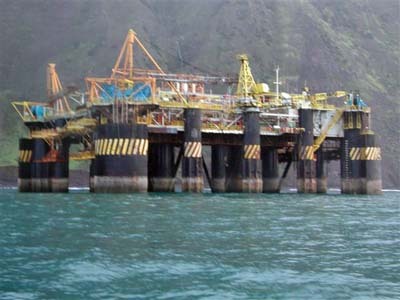 Oil Platform PXXI broke loose from its tug washed ashore at Trypot n Tristan on 7th June 2006. Salvage attempts failed and it was towed offshore to be scuttled on 11th February 2007. Released in mid-Atlantic on 30th April 2006, lost on 16th May, sighted briefly on 23rd May, and found by Tristan Islanders on 7th June - the largest vessel ever to have foundered in Tristan waters has finally turned turtle for the last time 289 days after being cast adrift (and at least 250 days after being wrecked at Trypo) in February 2007. Choose whether to read the entire saga from the top....or Click to go to latest news direct from the South Atlantic. and threaten one of the world's most precious environments? The Tug Mighty Deliverer Departed from Macae in Brazil on 6th March 2006 en route via Cape Town to Singapore towing a semi submersible oil platform PXXI. ; Due to bad weather it was forced to release the oil platform on 30th April 2006. Position 35.48s and 013.35w in order to avoid risk to the tug and towage. Eye Contact was maintained until 10th May, but, during bad weather the platform PXXI began to draw away and was lost on 16th May. Later sight of the unmanned, bunker and contamination free platform was re-gained at 11.00utc on 23rd May, position 35.56s and 013.58w approx 98 miles NW of Tristan. A second contact was made at 15.30utc position 37.14s and 013.26w approx 55 miles West of Tristan and approx 36 miles west of Inaccessible. Sight of the platform was again lost. Another Tug Ruby Deliverer joined in searching for the platform, with no success. Islanders have found the missing Oil Platform PXXI on washed ashore on the South-East coast at Trypot (see map page). The platform measures 104 metres x 103 metres with a draft of 13 metres and is 6357 gross tonnes in weight. Islanders were engaged in a winter trip to Sandy Point for beef cattle on Wednesday 7th June, and, whilst the boat was off shore fishing the sighted the platform on one of Tristan da Cunha's most inaccessible stretches of coastline. Sheer cliffs rise some 500 metres from a narrow boulder beach which from late August is occupied by a breeding colony of Northern Rockhopper Penguins. A search party in the two Police RIBs set out today (8/6/2006) to investigate the wreck and report to the owners. There have been several storms and high seas in the South Atlantic since the platform was last seen west of Tristan on 23rd May. The Search and Rescue RIBs were coxswained by Agriculture Officer Neil Swain and Police Inspector Conrad Glass, and crewed by Mark Swain, Duncan Lavarello, Joseph Green, Leon Glass and Jack Green accompanied by Head of Natural Resources James Glass and Conservation Officer Simon Glass. 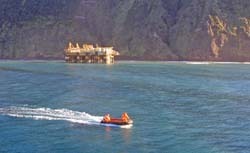 They inspected the huge oil rig marooned on a reef some 250 - 300 metres offshore from Trypot Beach. The beach is named after a Trypot erected in the early 19th Century to 'try' the fat from the thousands of Antarctic Fur Seals and Southern Elephant Seals hunted and killed by early settlers on Tristan da Cunha's wild shores. The only sign of environmental damage was a small diesel oil-slick and no apparent sign that the rig had been broken up by recent storms. Rockhopper Penguins, who normally occupy on-shore sites for breeding between August - December (laying eggs in September) and for moulting between January - March (see Penguins Page). The Island's fishing season will begin on 1st July and it will be interesting to assess any effect the stranded oil rig will have on the reef environment which supports the crawfish (see fishing page and fishing news page) and other marine biota. Firstly, it seems that PXXI has 'turned turtle' in more ways than one. Firstly the full original name of the platform (used in all official correspondence until today) was Petrobas XXI. However, whether it being the result of its capsize on Tristan da Cunha or not, the owners Catleia Oil Company, based in the Cayman Islands confirm that it is in fact called 'A Turtle'. Secondly, we learn that the company Charles Taylor Consulting have been employed by the owners and are in negotiation with a salvage company with a view to the recovery of the platform. They envisage sending a powerful tug from South Africa with equipment for diving and for carrying out any incidental repairs that are necessary to the platform. The team on board the tug would assess the situation and, all being well, would tow the platform off and take it to Cape Town. They now understand that the platform may be beached on the sloping seabed rather than aground on a reef and this may make the task of removing it easier. It will take the salvage team between five and six days to reach Tristan after mobilisation at Cape Town so it does not appear that anything is likely to happen very quickly.In the meantime mid-winter approaches in the South Atlantic. A salvage team from SMIT Salvage, under the leadership of Salvage Master Captain Ian Carrasco, left Cape Town on Friday 16th June destined for Tristan da Cunha with the aim of solving the challenging problem of the grounded PXX1. The salvage team aboard tug ST 'Zouros Hellas' captained by Salvage Master Ian Carrasco have reported a delayed passage to Tristan da Cunha due to high seas. The crew have been suffering sea-sickness and the estimated arrival time at the Edinburgh anchorage is now 18.00 GMT on Thursday 22nd June. The team will have room for two Islanders with local knowledge of the Trypot Bay site of the stricken oil platform 'A Turtle', and will proceed to this site as soon as formalities are cleared with the Tristan Government Administration. The tug is 1487 gross tonnes & 66.7 metres long. Its two engines can produce 10,000 BHP and it has a maximum speed of 15 knots, and a service speed of 11 knots. It has accommodation for 27 officers and crew. The tug carries several towing wires up to 1800 metres long and with a gauge of 26 or 32 mm. The team hope to send photographs to tristandc.com, but are hoping for weather like that when this photograph was taken, but rarely seen around Tristan! ST Zouros Hellas arrived at 16.30 GMT on Thursday 22nd June at the Tristan anchorage, passing MV Edinburgh en route to Cape Town. The salvage team came ashore for a planning meeting. It was decided to travel to Trypot Bay to reconnoiter the site, including looking at anchorage positions taking depth soundings. They plan to take the tug in close enough to the rig to attach lines to it and then work from there. A team of Islanders was headed by Police Inspector Conrad Glass, and Natural Resources Officer James Glass, accompanied by Mark Swain, John Lavarello and Martin Green. John and Martin are fishermen with local knowledge of the Trypot reef gained from setting crawfish pots over the years. The party departed in the small police RIB, with James Glass travelling on the tug. All the Islanders returned in the RIB. Poor weather between Saturday 24th June and Monday 26th June prevented Islanders joining the rescue team aboard the tug Zouros Hellas. Radio reports indicated that the team have completed their rig inspection and were calculating whether the rig could be successfully re-floated. On Tuesday 27th a RIB has set off from Calshot Harbour crewed by Neil Swain, Jack Green, Martin Green and John Lavarello. The rig has been inspected and it is believed that it can be floated off. The salvage team have been getting systems (compressor and emergency generator) running on board the rig. The Naval Architect is doing the necessary calculations to see what can be done to float the rig. It was discovered that one of the columns on the starboard side was flooded. Three columns on the starboard side aft are permanently aground, all other pontoons  have floatation. Soundings have been taken to the seaward of the rig in preparation for removal. The weather improved and at 08.40 the tug positioned herself close to the rig. The rubber boat was launched at 09.10 to pick up the floating line on the towing pennant of the rig and hand it to the tug. The tug anchored at 09.15 and preparations were made in the morning until using various power settings either side of high water at 15.00 in an effort to re-float A-Turtle. Although there was a lot of shaking in the rig, she did not move one cm. During the towing, the salvage team worked on the rig to replenish some fuel for the navigation lights generator and the emergency set. The re-floating effort was stopped at 17.00 and the tug retrieved her anchor at 17.30 as the wind and sea had increased again. Following the failure of Salvage Tug ST Zouros Hellas to free the stricken rig, a decision has been made to mobilise a second tug to help free A Turtle from the Trypot reef. An attempt was made to get aboard the rig A Turtle but the swell was too big to gain safe access. The salvage team expected to carry out a dive inspection on the starboard side pontoon but dive conditions (swell and visibility) were not suitable. Also found that two ballast tank on the starboard side are flooded having been penetrated from the outside. They are preparing to place pumps on board to see if they can reduce the quantity of ballast water on board through pumping or air pressurisation. This will take a few days to set up in preparation for when the second tug arrives. Members of the salvage team aboard their Zodiac returning from an unsuccessful attempt to dive (see above) with A Turtle dwarfed by Trypot cliffs. Photo. taken aboard ST Zouros Hellas. Salvage team members aboard ST Zouros Hellas working out their next move to try to free A Turtle from what is hoped will be its temporary home. Conditions at the Rig in Tripod Bay were again suitable for gaining access today. The salvage team is at present fabricating flanges for air connections for pressurizing the tanks that are tidal. [Open to the sea] In addition electric pumps and hoses have been positioned in the starboard pump room in an attempt to lower the level of water, and create more buoyancy when it comes time to re-float the rig. Approximately 100 tons of water was pumped out of the starboard centre column in 2.5 hours today. Soundings taken today indicate that the port [seaward side of rig] ballast tanks are intact. [not open to the sea] Status of the rig remains unchanged since the previous inspection, although the rig is still being subjected to heavy bottom contact on the port side, with resultant shuddering. The salvage team did not manage to gain access to the Rig this morning due to the prevailing onshore winds and unsettled sea conditions. The second tug, Fairmont Sherpa, is now scheduled to leave Cape Town during the morning of Wednesday 5th July, ETA Tristan Monday 10th or Tuesday 11th July. The tug has a capacity of some 200 tons bollard pull. 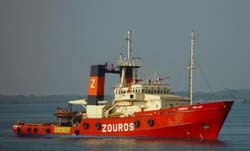 It is now calculated, that, in tandem with ST Zouros Hellas, it should provide enough power to re-float the Rig. Very strong north-west winds and rough seas have prevented access to the rig this morning and the forecast is poor for the weekend ahead. Plans for the dispatch of a second tug from Cape town have been changed and delayed. It is understood that the tug 'Sea Tiger' is due to depart on Saturday 8th July, ETA Tristan da Cunha Thursday 13th or Friday 14th July. Strong winds over the weekend have continued to prevent access to A Turtle, and today there are strong South West winds and heavy seas. It is thought seas will moderate tomorrow, meanwhile the tug Zouros Hellas has anchored at the Tristan Settlement anchorage and some of the crew are spending a few hours ashore. The tug Sea Tiger's departure from Cape Town has been further delayed. The salvage team was not able to board the Rig again this morning due to a large SW swell and unsettled sea conditions, which makes it unsafe for them to board by R.I.B. Yesterday afternoon the Tug “Sea Tiger” was ready to leave Cape Town for Tristan when she encountered technical problems in the engine room, and was not able to depart. We are awaiting confirmation as to the extent of the damage and time frame necessary for her to complete the repairs. In the meantime the Owners/Underwriters of the Rig “A Turtle” are looking at other alternatives. At present we are anchored off the Settlement seeking shelter from the South Westerly swell. Our Naval Architect is re-evaluating the situation on board the Rig, which should be complete by tomorrow with recommendations. The salvage team has been making steady progress on board. Drainage of compartments continues, and we expect to carry out a dive inspection on the Rig when conditions are suitable. No confirmation has been received to date on the availability of the second Tug, now that Sea Tiger is not available, and the Rig Owners are looking at the possibility of using a tug working out of Cameroon – West Africa , which may be available from 13th July. The salvage team managed to board the Rig today to carry out an inspection, and continue with efforts in preparation for the second pull attempt. During the inspection a further ballast tank on the inboard starboard pontoon was found to be tidal, 2 m of water was found in the pump-room on inner starboard side, and efforts to pump water from flooded columns and ballast tanks continue. No further news of a 2nd tug being booked to assist. During dives it was confirmed that the rig remained in its original position when it went aground on the Trypot reef, and this contradicts a report, received on 12th July and based on GPS, that the rig had moved 27 metres towards the shore. That report has now been erased. The salvage team boarded the rig and the inspection revealed details of breaches to columns and build up of black volcanic sand. The rig was ballasted today on the port side pontoon to secure it on the sea bed in anticipation of bad weather approaching. The salvage team, pumping columns to allow inspection, and ballasting tanks to prevent anticipated storms moving the rig. The salvage team were not able to gain access to the rig today due to unfavourable weather conditions. There is no further news on the passage of a second tug, following problems with Sea Tiger's sea worthiness a week ago, and attempts to book another tug on 12th July. Captain Ian Carrasco came ashore yesterday as they were sending a crew member back to Cape Town on the Kelso (which sailed on Tuesday evening) on end of contract. He and his team have succeeded in stabilising the rig so that, once refloated, it will be seaworthy enough to make it to a dockyard for the full repairs needed. But the company have yet to complete arrangements to charter the second tug needed to refloat it and take it safely and securely under tow. Warren Glass of Natural Resources Department will join the salvage team environmental officer to ensure that all of our conservation interests are being met, and the Island Store is providing additional supplies for the crew as their stay here has been longer than initially planned! Photograph from Joe Green of the tug ST Zouros Hellas and MS Kelso anchored off the Tristan Settlement on 18th July. Warren Glass joined the vessel on 20th July, and stores from the Island Store were taken aboard. Poor weather continued to prevent access for this period. No further news of a second tug being secured to assist in re-floating the rig. Heavy weather conditions off Tristan da Cunha continue as forecast. A decision has been taken to postpone attempts to re-float the oil rig A Turtle until winter weather has moderated, so Zouros Hellas has now returned to Cape Town. The salvors will await favourable conditions and the availability of suitably powerful tug (s). This is unlikely to be until September at the earliest. The Insurance Company have advised Tristan that they are reputable, are not abandoning their responsibilities but are merely deferring the operation until later in the year in the difficult circumstances. 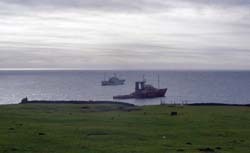 Tristan da Cunha awaits the return of the salvors when a tug (s) of sufficient pull (200 tonnes +) become available. We learn that all are presently on long-term charter, but that 3 will become available in the second half of September, so that a float attempt is not now likely until early October, weather permitting. The salvors have thanked the Islanders for their support and assistance during the attempted salvage operation. They have also assured the community that the rig only contains small quantities of pollutants, all safely contained on the upper decks of the rig, 15 metres above the waterline. The emergency generator on the second deck contains some 600 litres of gas oil, contained in a tank in the generator compartment. Most other oils and lubricants are contained in 25 litre containers and 210 litre drums. Islanders have been warned to stay away from the rig, as it is nearly 40 years old, badly corroded, and poses a large safety risk to any personnel on board.The rig was being towed to Singapore for repair and refurbishment. Meanwhile, winter seas continue to batter the stricken rig, which is directly offshore the Trypot Rockhopper Penguin Rookery to which breeding pairs are now claiming nest sites ready for egg laying in September. Despite assurances from optimistic salvors, there must be a concern that the rig could break up to an extent that a salvage operation ( to its planned destination of Singapore for repairs ) will not be worth the expense, given the original state of the rig and subsequent damage. Divers Sue Scott and Geoffrey Fridjohn arrived on the SA Agulhas to carry out dives from the stranded oil rig to make an assessment of any alien marine life it might have brought into Tristan waters. Sue and Geoffrey have made previous studies of the Tristan marine habitat and tristandc.com awaits their findings with interest. Sue Scott is preparing a publication on the Tristan marine ecosystem and it is hoped an illustrated article will appear in the January 2007 Tristan Newsletter. James Glass, Tristan Head of natural resources reports on 25th September that due to extremely bad weather only two dives have been carried out since their arrival.The first attempt to dive at the rig lasted only ten minutes due to heavy swell, the second, which occurred the next day (22nd September) was more successful lasting 55 minutes, and involved collecting specimens, and taking photos.In the better conditions of lighter swell and slightly improved visibility, they were able to examine the outer legs on the seaward side of the rig.The upright parts of the rig legs were coated with large quantities of dead coral, barnacle and oyster shells, while the horizontal sections had less coral but more oyster and other bivalve shells, amongst them were some live animals.Many of the barnacles (at least three species) at depth were alive, as were some oysters, a few small hard corals, a few large mussels, large dark red anemones, all of which are non-native to Tristan. Collections of all the living biota were made, and will be process in the next few days. The weather has since turn nasty but every opportunity will be taken to carry out more dives at the rig as soon as the weather improves. This photograph taken on 7th July from Robin Repetto showing ST Zouros Hellas and the stricken oil rig A Turtle off Trypot. The Kelso was here from 28 October to 4 November on charter to London Overseas Consultants Ltd who represent the owners and insurers and who brought a survey team down to re inspect the rig and assess how best to remove it as soon as possible. Diver Sue Scott collected marine flora and fauna species and is assessing whether these could be of possible harm to the endemic varieties - which themselves were originally introduced here too. tristandc.com can reveal that the Governor of St Helena and its dependency Tristan da Cunha has issued a permit under the Environmental Protection (Overseas Territories) Order 1988, for the stranded rig to be disposed of at sea, with due regard to meeting environmental concerns. We now expect a suitably experienced contractor to be appointed to undertake the job of removing the rig as soon as possible. Work could begin as early as mid-December. It may be that the Kelso will be chartered to support the salvage work. If so, the Edinburgh will probably replace the MV Kelso on the first New Year scheduled sailing between Tristan & Cape Town. This photograph was taken during the St Andrew's Day circumnavigation of Tristan by HMS Edinburgh by Janice Hentley. It shows the grassy slopes of Tristan's eastern extremity at Sandy Point, the Oil Rig still stranded of Trypot Bay, the rugged lava peninsular of Stony Hill protruding behind, and to the South West the jagged Nightingale Island. HMS Edinburgh's helicopter also provided access to the rig for a survey team and we await their report and hopefully some spectacular photographs. Zurich based newspaper Tages-Anzeiger has today published an article by journalist Christian Schmidt on the stranding of the oil rig "A Turtle" on the shores of Tristan da Cunha. The can be translated as : "An oil rig in a sea of silence".tristandc.com and the Tristan Administration provided information for the story, and the UK Foreign and Commonwealth Office have also provided a 'Press Lines' briefing containing questions and answers which are reproduced below. The January Tristan da Cunha Newsletter will feature a detailed feature on the oil rig saga, hopefully confirming its removal from Trypot's shores. A contract for the salvage of the oil rig was awarded to Titan Maritime of Fort Lauderdale, USA on 6th December. Their team of salvage workers will sail from Cape Town in two parties and will arrive over the Christmas period. Their aim will be to carry out the work as quickly as possible. A contract for an environmental inspection will be signed shortly. tristandc.com has learnt that a chartered plane will fly from Stansted Airport in England to Cape Town on 18th December with specialist equipment to be shipped to Tristan da Cunha to aid the efforts to remove the stranded oil rig from Trypot Reef. MV Kelso arrived on Friday 22nd December with the advance salvage party plus the environmental team who will be completing the marine survey which Sue Scott started during her September visit. The salvage work to prepare the rig for floating began on 23rd December and will take an estimated three weeks. The Titan salvage team have been working on the oil rig from MV Kelso all week in sometimes difficult conditions with strong winds and heavy sea swell. The environmental dive team (Warwick Sauer, Brian Godfrey & Ross Wanless) have also been assisting. The 3180 tonne salvage tug De Hong, built in 2000 in China, chartered by salvors Titan and sailed from Cape Town on Christmas Eve, Sunday 24th December, and arrived at Tristan on Friday 29th December. Photograph from Tristan Administrator Mike Hentley of the salvage tug De Hong alongside the stricken oil rig A Turtle on Saturday 30th December getting (what is hoped will be) the final stage of the oil rig's removal underway. Preparations for the refloat of the oil rig are going according to plan. Divers are starting to insert air bags in the flooded areas in order to give buoyancy to the pontoons and columns on which the structure will float. New wire is being spooled on the two huge winches aboard the rig which will be used to anchor it when the floating operations begin, and which then will help pull it off the reef when the towing starts. The plan is to lift her up and float her off, so surplus pipe work and structure (such as the helideck) will be cut away and back loaded on to the tug in order to reduce weight first (every 5 tonnes of scrap weight removed will give another centimetre of buoyancy - not a lot of people knew that!). A small team of Tristanians are assisting with the work: handling the boats shuttling the work teams and supplies between the rig and the Kelso/De Hong accommodation & support vessels, and assisting with the scrapping/weight reduction operations. 5th January : Titan have arranged to charter MV Edinburgh to bring urgently needed supplies, bringing forward the planned trip from 18th to 12th January, to arrive on Tristan c. 18th January. Salvage operations are going well, with some 300 tons of scrap metal already removed to reduce weight and assist flotation of the rig structure. The divers may have to resort to drilling - or even blasting - a way through the reef on which the rig is stranded in order to float it out to sea. There have been unforeseen delays as the salvage team encounter and work around problems not anticipated during the original brief survey visit in October. It is understood that the Titan team are now looking at the spring tides on or around 18 February as a suitable time to attempt the re floating and towing, and that they are rearranging their work programme accordingly. trisrtandc.com has also learnt that the rig will be towed some 12 miles from the island to finally consign the rusting hulk to the deep, provided the 6357 tonne platform can be shifted (despite listing and crumpling of its legs as it has been driven ashore) and floated off. Hopefully the spring tides on 18th February will also be accompanied by light winds, rare on Tristan, but more likely at this time of year. MV Edinburgh arrived in Trypot Bay and delivered important materials and additional fuel to the tug De Hong in support of the salvage operation. Could this be the start of the final countdown for the salvage operation? Although it could take another 3 weeks yet, this formal 7 days notice below sent from the salvors Titan on 29th January enables the salvage team to take advantage of any favourable weather and sea conditions occurring after that to attempt to refloat the rig. '...Titan may attempt to refloat the A TURTLE in approximately 7 days. The actually re-floating date will be determined on the success of the salvage team in the coming weeks, as well as the weather conditions'. The salvage team made a first attempt on Saturday 3 February to refloat the oil rig stranded at Trypot Bay. The top picture shows the tug De Hong putting up to 70% power onto the tow. However, although there was plenty of buoyancy on the port side of the rig, the tides were not sufficient to lift the starboard side clear of the reef. The main attempt to refloat is still scheduled for mid-February, and the team will be working hard until then to regain some more of the buoyancy they need. A photograph (middle) showing clearly (compared with the situation in December) how much of the structure has been cut away to remove weight to assist the salvage attempt and the amount of buoyancy obtained, particularly on the seaward size of the rig, where the previous waterline mark shows how much further the support columns have lifted out of the water. Lower photo. shows the two Tristan vessels Wave Dancer (cox Joe Green) and the police RIB Atlantic Dawn (cox Connie Glass) in Trypot Bay who went with MV Kelso (from where the photograph was taken) to lipase with the Tristan team on 3rd February. View a photograph and report of Mark Swain's catch while aboard the MV Kelso, chartered to support the Titan team in Trypot Bay - see Fishing News Page. I'm delighted to report that A Turtle finally turned turtle and was scuttled at a depth of 3500m some 10 miles east of Edinburgh settlement around 0600 on the morning of Sunday 11 February, some 9 months after being stranded on a reef off Tristan's south east coast. After last weekend's failed attempt to refloat and tow it off the reef at Trypot Bay, the Titan Salvage team began de-ballasting the rig on Friday for a second attempt. This ended abruptly with a broken tow line, and a third pull was then made late in the afternoon, with a successful refloating accomplished and the rig moved offshore. Conditions remained favourable, so the tug De Hong then began the tow to the approved dump site at a speed of 3 knots, arriving there around 0200 on Sunday morning. The final phase of the operations to scuttle the rig commenced at first light, and ended with the structure listing to starboard before turning turtle and sinking rapidly into the depths. Both the tug De Hong and the support vessel MV Kelso are now on their return journey to Cape Town, and are expected to arrive there by next weekend. This is to advise you that the oil rig 'A Turtle' has been towed out of Trypot Bay and scuttled within Tristanian waters. The rig was towed out of the bay at 1800/10th February and towards the dump site identified in the Permit issued by the Governor of St Helena as Site A. Best endeavours were used to tow and sink the rig as close as possible to the site. 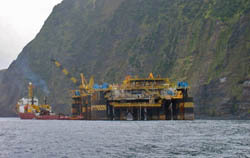 The winds were strong from the north west and in anticipation of the rig being set downwind if the site was aimed for directly, the tug towed the rig to a position 3 miles north west of the site. In this position which was reached at 0330 LMT this morning, 11th February, irreversible steps were taken to ensure the rig sank and the salvage crew left the rig for their safety. The rig moved towards the dump site but sank more quickly than anticipated. Best endeavours were used to place the rig over the exact position and the rig sank in position 37 01.46' South, 12 01.82 West which is 1.9 nautical miles north west of Site A and 10.3 nautical miles from the nearest shore line of the island.The position is therefore within Tristanian waters, as instructed. Notwithstanding this, the rig has sunk in about 3,400m of water depth and virtually no debris of any kind surfaced from the rig. The remaining diesel fuel had been pumped to the tug during this last week and only a small slick approximately 100m square was visible. This will have dispersed by this evening in the prevailing winds. Thank you for all your assistance and hospitality over the last two months to the salvage team, the Observer team and to me. It has been sincerely appreciated. Thanks also to the people of Tristan da Cunha for their patience and understanding as the considerable damage caused to the rig by the notorious Tristan weather extended the duration of the job. Those bangs that were heard would not have been the bags which collapse gently as the external pressure increases with depth. Very likely to have been the cylindrical sealed structures (legs etc) that would have resisted the increasing external pressure until they suddenly imploded. It is this phenomenon that accounts for one of (what I think at least) the worlds most astonishing facts. When doing seismic surveys using explosives for the sound source in very deep water, the external water pressure is so great that even big charges produce only a wimpish 'bang'. Solution, a glass sphere about 9" diameter is scoured with a tiny scratch which propagates failure at a predetermined depth of say 4000m. When it ruptures, the implosion is so violent it make a bigger bang than dynamite. The most amazing thing is the sphere is made in two halves with 'perfect mating edges' and just held together with tape until it submerges. Thereafter, the increasing water pressure forces the two halves together so tightly it doesn't leak until failure! tristandc.com is still waiting for pictures of the final tow and scuttling - perhaps not of the latter as it took place in darkness. 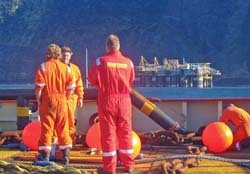 Enviro-Fish Africa Ltd of Cape Town will complete an environmental risk assessment of the stranding and subsequent salvage operations, and their report will be recommending longer term monitoring of the affected areas. The fact that the rig has been removed successfully means that there is very little risk of any pollution of the environment, which is very good news. Nevertheless we will make subsequent reports available here and a full prose assessment will be published in the July Tristan da Cunha Newsletter. Captain Peter Holloway of London Offshore Consultants (who was supervising the oil rig salvage operations on behalf of the Insurers) has provided this dramatic shot taken at 05.30 on Sunday 11th February 2007. 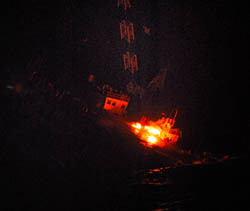 The only pictorial evidence to show this furtive departure into the dark depths was this photograph showing flames lighting up the upper office and the deck where once was the helideck. tristandc.com learns that a group of Brazilian porgy fish made the rig A Turtle their home and had swum with it as far as Tristan. The theory was that they would follow it to the dump site and then perish during the scuttling operations or be eaten by predators once their home had disappeared - thus ending another risk of alien species invasion! We await confirmation of their demise.